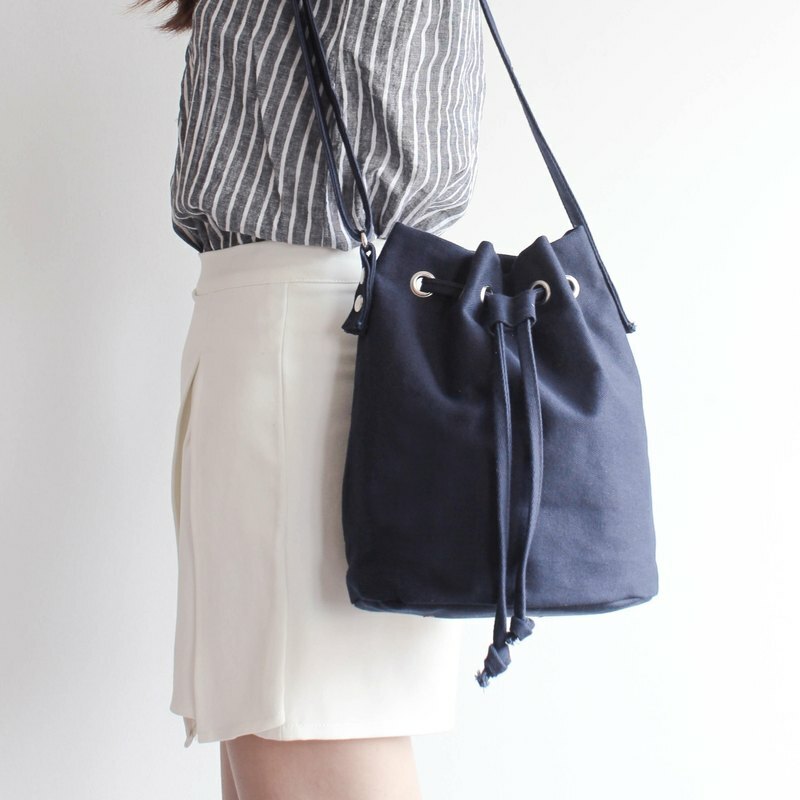 Bucket bag ____________ Available in Black : https://en.pinkoi.com/product/RnjYkKuK?category=1 White : https://en.pinkoi.com/product/QsaLUivG?category=1 Brown : https://en.pinkoi.com/product/myq9JmUb Navy : https://en.pinkoi.com/product/PdXQW2Xg?category=1 Red : https://en.pinkoi.com/product/hxCrM9cN Grey : https://en.pinkoi.com/product/chBKHqR7?category=1 ____________ Size : 23 * 29 * 15 cm Strap is able to adjust from 50 cm-100 cm ____________ Made from premium twill canvas and lining with linin. ____________ Manufacturing location(s)/process(es)hand made products from Thailand https://farm5.staticflickr.com/4406/37297465662_fdd174e65a_o_d.jpg **OUR PURPOSE** /////////////////// " We would like to be a part of helping support your daily life. We take care all of process by find the best and proper materials to make you confident in everywhere you go, suitable forming pattern design in simplicity and ease with nice cutting for our quality products to be your best beside. " https://farm5.staticflickr.com/4337/36618459584_4421547bc3_o_d.jpg https://farm5.staticflickr.com/4479/36658477313_081bd4f743_o_d.jpg **OUR STORY** ///////////////////// We started designing daily bag in 2014, when I was a student in major of Textile industrial design. First I used knowledge of fabric to custom my own stuff, respond my life’s routine. It have to be high capacity, easy to use, no need to beware and good looking. My bag was interesting by other student and gradually spread out. Nowadays our bag is not only well known in student society but also in Asian early worker like Taiwan, Singapore, Hong Kong, Thailand and other Neighboring countries. I have a pleasure to create great product for you all. Thanks for your support and we promise to develop it better in every our growing steps : ) https://farm5.staticflickr.com/4335/36618459414_fdcdc6f9ea_o_d.jpg MATERIAL /////////////////// ‘ Unspoken is the winner of best independent. ‘ In every material we use have been selected scrupulously in condition of function and aesthetic simple way. No need any words, it will be spoken when you touch and use.